This December the RSPCA Halifax, Huddersfield, Bradford & District Branch are calling on their supporters to help them give the animals in their centre the best Christmas possible. When most of us think of Christmas we imagine family, food and love, but the reality is quite different for animals spending the festive period alone in a rescue centre. Although the RSPCA staff work really hard to make the animals feel comfortable, happy and loved all year round, Christmas is always hard as nothing can compare to the surroundings of a loving home and lots of treats. 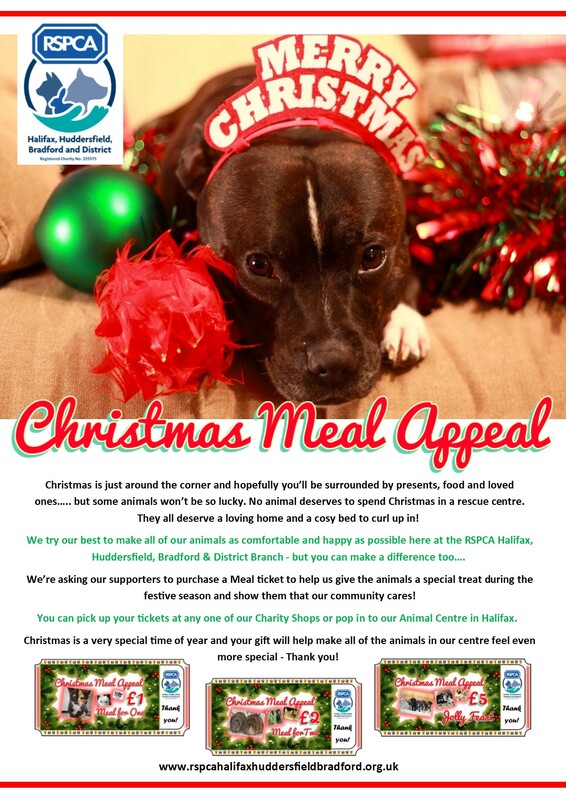 This year your local RSPCA hope to give the animals in their care the best Christmas possible, which is why they need your help by donating a festive feast in the form of a Christmas Meal Ticket! The tickets can be a personal donation or make ideal gifts and stocking fillers for family and friends. You can also donate online if you just wish to give the animals a special Christmas gift. To donate to the Christmas Meal Appeal online, please visit: https://www.justgiving.com/campaign/Christmasmealappeal. So far this year the branch has successfully found homes for 111 dogs, 281 cats and 73 small animals and they hope that with the support of the local community they can give all the animals currently waiting to be adopted the best Christmas possible.